The couple behind Bon Glaze built their dream kitchen after losing it in a fire. J. Thomas Designs and John Willis Custom Homes worked together to redesign and rebuild this tranquil kitchen after a devastating fire. Could you imagine losing your home in a fire? For Kelly and Kenny Keith, the co-owners of artisanal doughnut shop Bon Glaze, that frightening scenario was their reality. Reflecting on the day in July 2016, Kelly recalls, “We heard the loudest crack of lightning that we ever heard in our lives. My husband said to our 11-year-old, Brooke, ‘Let me show you what it looks like when lightning hits a tree,’ because, of course, you don’t think it hits your house. It’s the oddest thing.” Fortunately, everyone in the house made it out safely, and after a year and a half of renovations they’re back in their Sandy Springs home. 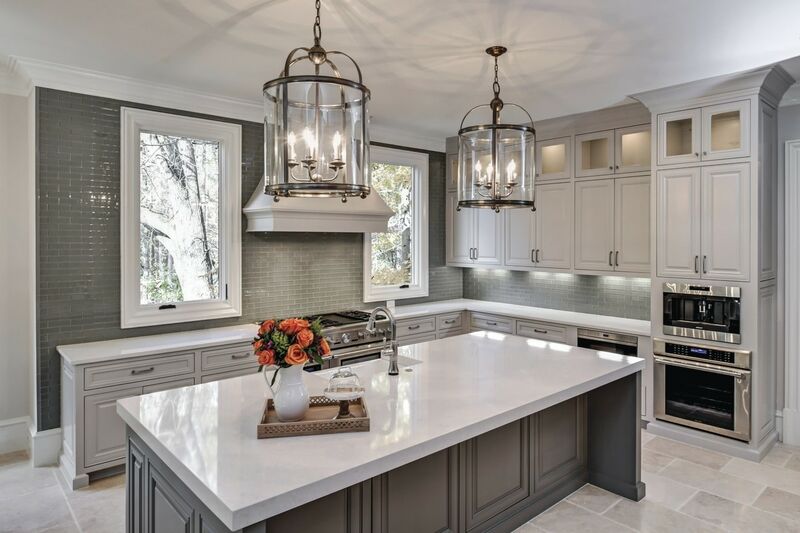 Working with Jenny Warner of J. Thomas Designs and Bobby Livingston of John Willis Custom Homes, the Keiths were able to rebuild their home, and for Kelly, that meant a dream kitchen. “I wanted the kitchen how I’ve always envisioned it, but very functional too,” she says. The kitchen is the family’s playroom, where they develop products for their shops and Kelly’s Cakes (her wedding cake business). “Brooke may get a crazy idea at midnight to make a pineapple upside-down cake doughnut so we’ll come down and get the flour out.” The counters are a glimmering white Cambria quartz, which is antimicrobial and stain-resistant—perfect for chefs that have a flair for colorful creations. Part of Kelly’s vision was a lighter and brighter space. Two small dormer windows were replaced by large vertical picture windows that allow the sunlight to reflect off of the counters. The gray subway tile backsplash and white cabinets add to the light, airy feel. With a chef’s penchant for commercial appliances, the kitchen boasts commercial-grade Wolf appliances, a built-in espresso machine and an integrated double Sub-Zero refrigerator. For a couple in the restaurant business who spend a lot of time in professional kitchens, it’s nice for the Keiths to have this bright sanctuary at home. The appliances may be the same as what they use at Bon Glaze, but the tranquil environment is conducive to family cooking time—and experimenting with new doughnut flavors.